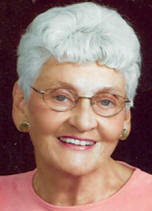 OSCEOLA - Jeanette M. Soltys, 79, died at 9:15 a.m. Wednesday May 20, 2009 in Our Lady of Peace Hospital, South Bend. She was born on June 11, 1929 in Plum City, WI, to the late Frank and Magdalene (Sagstetter) Hince. On June 20, 1953 in Minneapolis, MN, she married Joseph L. Soltys who preceded her in death on August 24, 2005 in Osceola. She was also preceded in death by a sister, Edith Hoffman and a brother, Joseph Hince. She was a retired registered nurse. She graduated in 1947 from High School in Farmington, MN. Received her nursing degree in St. Paul, MN. She was a member of Queen of Peace Catholic Church, Mishawaka and a member of St. Anthony's Circle at the church. Jeanette enjoyed working in her flower garden and feeding and watching the birds. Survivors include sons, Mark (Pat) Soltys of Smokerise, GA and Frank (Mary Ellen) Soltys of Great Falls, MT; daughters, Mary (Mike) Church of Elkhart, Edith Gulley of Plainfield, IN, Clare Soltys of South Bend, Jane Soltys and her husband, Jack Gilbert of Palm Harbor, FL, JoAnn Soltys of South Bend, IN, Veronica (Greg) Soltys-Niemann of McKinney, TX and Adele (Shawn) Thurin of Palm Harbor, FL; 27 grandchildren; five great-grandchildren; and two brothers, Frank (Gloria) Hince of Plum city, WI and William Hince of Farmington, WI. Funeral mass will be held at 12 p.m. (noon) Saturday, May 23, 2009 in Queen of Peace Catholic Church, 4508 Vistula Road, Mishawaka, IN, with Fr. Daniel Scheidt officiating. Interment will be held at a later date in St. Vincent Cemetery. Friends and family may call from 9 a.m. until 11:30 a.m. Saturday in Zimmerman-Inman Funeral Home, Osceola Chapel, 1109 Lincolnway W., Osceola, IN, where a Rosary will be said at 9:15 a.m. Saturday. A procession will form at 11:30 a.m. Saturday in the funeral home. Burial will be held at a later date in St. Vincent Cemetery. Memorials may be made to Queen of Peace Catholic Church. Jeanette kept a copy of "A Creed to Live By" posted on her refrigerator. The copy she had was read at her funeral and may be downloaded by clicking here. The original was authored by Nancye Sims as a poem and is posted below. By living your life one day at a time. Don't be afraid to admit that you are less then perfect. It is a fragile thread that binds each of us to each other. Don't shut love out of your life by saying it impossible to find.